New Nokia-built Vertu phone to finally come packing high-end specs? 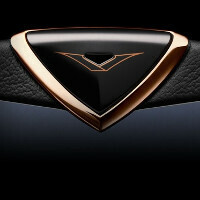 Vertu, a company spawned by Nokia all the back in 1998, is known for its extremely expensive phones made out of all kinds of exotic materials. Indeed, design and use of materials has been and continues to be the main selling point for Vertu's line -- the $10,000 Vertu Ti is made out of titanium and sapphire glass, for example. Of course, that 10 grand price tag puts off the near entirety of Earth's population, though that's not Vertu's only problem. Said simply, its phones usually pack some shockingly outdated hardware that is just out of sync with trends. This could very well change, or so would an AnTuTu entry by a supposed upcoming Vertu phone suggest. The 'Signature Touch (RM-960V), as the phone is currently known as, packs quite the modern hardware compared to previous generations of Vertu phones. It has a display of unknown size with 1080x1920 pixel resolution, a powerful quad-core Qualcomm Snapdragon 800 chip ticking at 2.3GHz, 2GB of RAM, and a 13-megapixel rear shooter. The pass also reveals internal memory to the tune of 16GB (no info on microSD slot), and we also see that the RM-960V will come outfitted with the very latest Android 4.4.2 KitKat update. Believe it or not, that's actually a massive hardware upgrade for a Vertu phone. For example, the aforementioned Ti has a 3.7-inch, 480x800 resolution display, a dual-core Snapdragon chip, and 1GB of RAM. We obviously don't yet know if this unconfirmed Vertu phone will come bearing the same luxurious price tag -- Nokia did sell off Vertu in 2012 to a private equity group, which may be looking for a change in its approach. We're also unaware of a release window, but rest assured that we'll be keeping an eye out. the regular 8800 is my favourite phone till this day. When did Apple and Samsung ever claim they invented a gold smartphone? Please quote the article. What has this anything to do whatsoever with the gold phones ? Read the article. its vertu article they make luxury phone including gold one's since 1990's whats wrong if i give them credit for what they deserve? Oh, okay. I wasn't aware they made gold since such a long time. Thanks for the info. Not totally true. Nokia still owns a 10% stake in the company. However, on point, Nokia still designs and builds these phones for the company as a whole. So, you can (right at this very moment) buy a Nokia designed and built device running full Android. That phone, however, will cost most if us an arm, leg, and first-born child. Cheers. Do Vertu still belong to Nokia? Last I heard they are now owned by a holding company that is run by a bunch of multimillionaires and billionaires. Nokia still owns 10% of the Vertu company.